A stunning tattoo which will always make maximum people look back again after a glimpse of it. 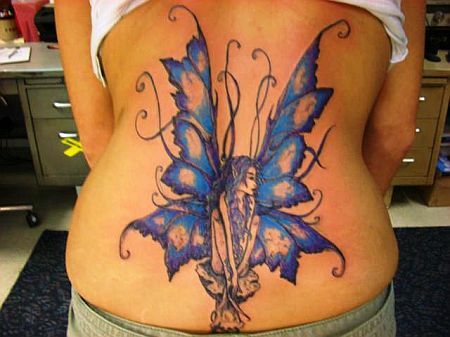 This is a beautiful fairy tattoo with gigantic wings, which covers almost complete back. The wings are inked in purple and blue color. The fairy is sitting with her opened wings and her tendrils blowing in air. The fairy is sitting in such a way as if she is thinking something and leaving the viewer to tally it with some fairy tale.